Below are the questions we are most often asked with our answers. We will continue to develop this and add additional information as we continue to develop and continue to get feedback from our visitors. So what is dressage to music? It is a fun way to compete in dressage competitions having put together the test yourself including the movements you like and your horse is good at. It is also a great crowd puller and people who know nothing about dressage can fully appreciate and enjoy Freestyle Dressage to Music. It must always be remembered that it is Dressage TO Music and not Dressage WITH Music. By this we mean that to the observer the music should fit the horse and the horses paces as well as the movement the horse performs. It should not just seem like someone is riding a dressage test with some music playing in the background. At the same time it is absolutely critical that the fundamental principles of dressage must always apply and be adhered to and the freestyle performance must never appear like a circus act. To give it another analogy. I know nothing about the technicalities of ice skating. I did however watch Torvill and Dean in the Olympics a few years ago now! I watched them perform the compulsory element which is where the competitors perform set movements without music, it was like watching paint dry, dull dull dull! I was also unable to determine whether they were better than anyone else I watched. But when it came to the freestyle section with music and they performed the now famous Ravel’s Bolero routine then WOW absolutely I was able tell how good they were and how much better they were than all the others. This is the same impact Freestyle Dressage to Music can and should have to both the expert and non expert “eye”. People who know nothing about dressage enjoy watching it when performed to music and can see who is better than who even without knowing the technicalities or understanding the principles of dressage. Dressage to Music brings together the rider and the audience in a way that no other form of dressage can do or arguably other equestrian discipline and it needs to be made easily available to everyone at all levels. This is why we have set up this web site. Is there anything I must include in the test? There are compulsory movements depending on the level you are competing at. If you fail to show a compulsory movement the judge will award you 0.If you include a movement that is only included in higher level tests you will be penalised for this. For example if you do a pirouette in a novice test you will receive two penalty points! How can I make sure I get as many points as possible? You need to try and include as many movements as you are able in addition to the compulsory movements. Choose ones you and your horse are good at. Keep to a minimum those movements that are not your strongest, and do more of what you are good at. It is important you make sure the size of the arena you practice in at home is correct as this is essential for your timings. If the arena you are working in needs to be smaller put poles around to make sure you are riding in the correct size arena. It is usually 20 x 40 for riding club level classes and 20 X 60 for affiliated classes. However you will need to check this. Aim to finish your test at X so if your timings are slightly out you have the flexibility to stop at G and not run the judge over! Try to choose music without words as the words often detract from the test you are riding. If music is too fast or too slow for the tempo of the horse it can make your horse look hurried or lazy, therefore it is important the tempo is correct for each pace. Make sure you do not end up chasing the tempo of the music you have chosen. If it is too fast for your horse there is a tendency to push your horse out of his natural rhythm. How do you choose what music suits your horse? Choose music that suits your horse and not what you like necessarily. Heavy metal music does not suit a dainty fine horse, but it might fit a heavy weight type. Usually when you ride your horse to the music, you and your friends can choose what suits the horse you are riding. if the beat of the music is not quite right we can alter it to fit the foot falls of your horse. How many types of music will I have to choose? You will need to choose three types of music, one for walk, trot and canter. You will usually need to choose different music with a different beat for each gait. An easy way to do this is to video walk, trot and canter of your horse and play music to the video when you get home to help you choose the music you like. Do I need music to enter the arena with? No you don’t as you get judged when you start in the arena, however you can enter to music if you wish and it give a better impression to have entrance music as it can set the scene for what follows. Does my test need to be symmetrical? This is open to debate. We have spoken with a number of judges and the general view is that most judges do not like the test to be completely symmetrical but you must maintain balance between right and left reins. How we got started in dressage to music? I first watched dressage to music many years ago and always wanted to try it. It was only when someone gave us a CD that helped to put together dressage to music test that I really got started. However it was not a straight forward process and we could see then why not many people were getting involved in this. We found the CD that made it easy was not quite so easy, finding music we liked without words was difficult, and putting it to the horse with the music gently moving to the next piece was challenging to say the least. After we managed to navigate all the hurdles and learnt a lot from the mistakes we made and the shortcuts we found we decided to offer the service to others. We started with putting together tests with music for friends and family and then others started asking for help. We have given a couple of displays to our riding club and the BHS. 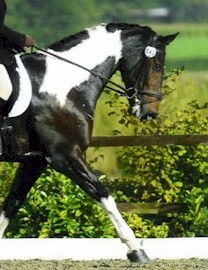 After these we were inundated with people asking for help with putting together dressage to music tests.